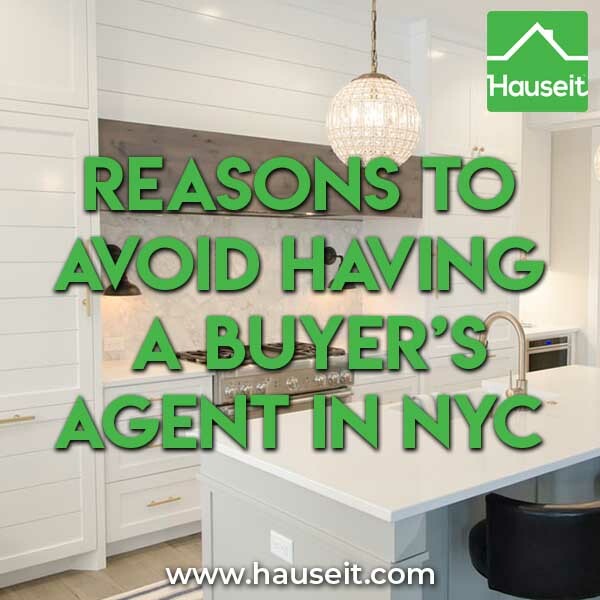 While it can be extremely beneficial to have a seasoned buyer’s broker help you navigate past common first time home buyer mistakes, it can also be very detrimental to work with the average buyer’s agent in NYC. Is my NYC buyer’s agent experienced? Will my NYC buyer’s agent give me a closing gift? Is it a good idea to work with a discount broker? Am I too needy to have a buyer’s agent? There are 50,000 licensed real estate agents in NYC, many of them with barely a high school education. Because sales deals are rare relative to the sheer number of licensed real estate agents in New York City, the typical buyer’s agent in NYC is not a home owner, has zero exclusive sales listings and has never done a sales deal. What’s worse is that a first time home buyer who has done any research online will know as much about real estate as your average NYC buyer’s agent. Your average NYC buyer’s agent will simply help you search for properties online and schedule showings for you. They will follow you around at showings and not add any value. They won’t have any calls with you to go over pricing, comps or the market. They won’t explain to you that offers are not binding until a contract is signed. They won’t even be able to explain to you that closing costs in NYC are significantly higher for new developments versus normal re-sales. Their help in scheduling showings is secretarial work that you can easily do yourself. Unfortunately, because every New Yorker seems to have at least 5 real estate agent friends, most NYC first time home buyers make the mistake of working with one of their friends on the most important transaction of their lives. This is often a major mistake because first time buyers are even less likely to second guess the experience and knowledge of their agent friends. Many home buyers won’t even bother to ask a single question about their buyer’s agent’s deal history! Despite making 3% of the sale price in commission, your typical buyer’s agent in NYC will attempt to cover up how much they’re being paid by the seller and will never reveal the deal sheet to the buyer. Buyers’ agents in NYC have always enticed home buyers to work with them because their services are billed as “free.” That’s because both the listing broker and buyer’s broker commission is paid by the seller. If the buyer refuses dedicated buy side representation, the listing agent will simply earn both sides of the commission. As a result, your typical buyer’s agent will attempt to get away with not giving their client any closing gift whatsoever, especially if they think that the buyer is still unclear on how their buyer’s agent is being compensated. What’s even more horrifying is that these same buyers’ brokers will often assure their clients verbally that they’ll take them out to celebrate after the deal is done. Some buyers’ brokers in NYC have assured their younger clients that they’ll take them out to go clubbing and pay for bottle service once the deal is over. Then, once these same buyers’ agents have been paid, they’ll simply disappear. When chased, they’ll respond typically with something like “sorry but I’ve already used the money for something urgent” or “sorry I’ve already budgeted the funds to pay for my cat’s surgery.” What a load of baloney! Note: Some better behaved agents have been known to stop by after the closing with a house warming gift for their client. However, these typically have low monetary value compared to the commission check received. Common gift choices include a bottle of champagne or a box of chocolates. We’ll explain below how to get more of the economics back at closing without compromising your chances of success. Working with a discount broker is an even worse idea than working with your average, inexperienced buyer’s agent in NYC. That’s because a discount broker who openly advertises commission rebates will be unable to get the full cooperation of listing brokers. It won’t matter how much commission this discount broker is promising to rebate if you aren’t able to get a deal done in the first place! What’s worse is that most discount brokers in NYC are small, mom and pop operations who are incompetent at best and shady at worst. They deserve the reputation they have among traditional brokers because they openly slander the wider brokerage community any chance they get. Just like any listing broker would do, simply search for the name of the discount broker online and you’ll be bound to see a stream of hateful content disparaging the role of traditional brokers and advertising how they’ll work for free. This is called biting the hand that feeds them since these same discount brokers are then requesting the listing brokers they just slandered to co-broke and share their commission. Needless to say, listing brokers are not pleased and will not be inclined to cooperate. 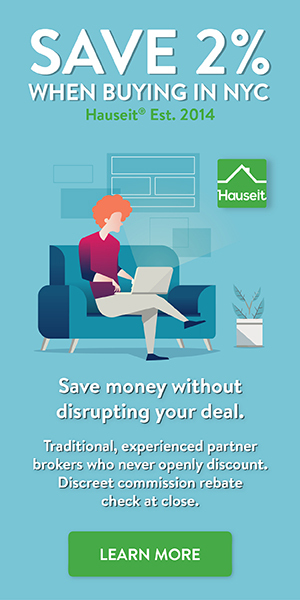 Hauseit gets around this problem by pairing buyers with highly rated, brand name brokerages in NYC who have agreed to discreetly provide private label discounts to our referrals as a way to supplement their existing business. All of our broker partners are highly rated REBNY Member Firms, some of which are among the top 10 in terms of residential sales transaction volumes in New York City. The Pareto Principle applied to real estate means that 20% of an experienced buyer’s agent’s clients will take up 80% of their time. Therefore, any good buyer’s broker will know to focus on the good clients who are grateful, respectful and independent. Any buyer’s broker who’s survived in this industry for more than a few years will also know to avoid and cut loose toxic clients that are demanding, needy and rude. Unfortunately in a place like New York City with many aggressive, type A personality working professionals, there are always bound to be a few bad apples. We’ve seen plenty of examples of bad human beings who believe it’s their right to call at all hours, be rude and excessively demanding, and act with general disrespect to veteran brokers who are on their side. If you believe that you’ll be very demanding, needy and generally disrespectful, then having a buyer’s agent is not meant for you. Good buyers’ agents who always have plenty of clients will try to avoid you, and you’ll never be satisfied anyway. Listing agents won’t enjoy dealing with you either, but they’ll likely have to just stomach it in order to earn both sides of the commission. Broker vs Realtor – What’s the Difference?